There is copious astrophysical and cosmological evidence for dark matter, but no indication of how it was produced, how it interacts with regular matter, or how it could fit into an inclusive model of particle physics. One possibility is that dark matter could interact with regular matter through some new mediator, a messenger particle with couplings to both regular and dark sectors, in which case it may be produced in high energy proton-proton collisions at the LHC. While the dark matter would not directly interact with the detector, the mediator may sometimes decay back to observable standard model particles. Since a likely production mechanism for such a mediator would be through the annihilation of two quarks within the colliding protons, the mediator could decay back to pairs of quarks. Due to a phenomenon known as color confinement, each quark would immediately decay into a shower of particles, called a jet, which the CMS detector can reconstruct. Searches for pairs of jets have been performed at all hadron colliders since the 1990s, as dijet signatures are ubiquitous in models of physics beyond the standard model. Indeed, the search for a dark matter mediator can be generalized to a search for some new particle Z’ with an unknown mass and unknown coupling strength to quarks. Searches were able to set limits on the production of these Z’ particles for masses ranging from 50 GeV to 5 TeV, but no limit existed on Z’ masses lower than 50 GeV, leaving a significant gap in our coverage of these models. The difficulty of accessing this low mass regime is due to the enormous output of hadron colliders: not all events produced can be retained and stored. The detectors rely on triggering systems to retain only events thought to be of interest to analyzers, usually by requiring a certain amount of total momentum to be carried by specific kinds of objects. For example while the LHC delivered 40 million collisions per second during data-taking in 2016, the CMS trigger system filtered out the events so that only a few hundred events were actually recorded per second. As the collision energy and total output have increased over time, the momentum thresholds had to be increased in order to keep the number of stored events under control. Because of these increasing thresholds, pairs of jets produced by relatively light Z’ particles would not decay with enough momentum to be recorded by conventional jet-based triggers, which favor high momentum particles. The result is a loss of sensitivity to Z’s with low masses. However, the incoming protons whose collisions produce the Z’ sometimes radiate another jet or a photon which would be detected simultaneously with the Z’ decay products. 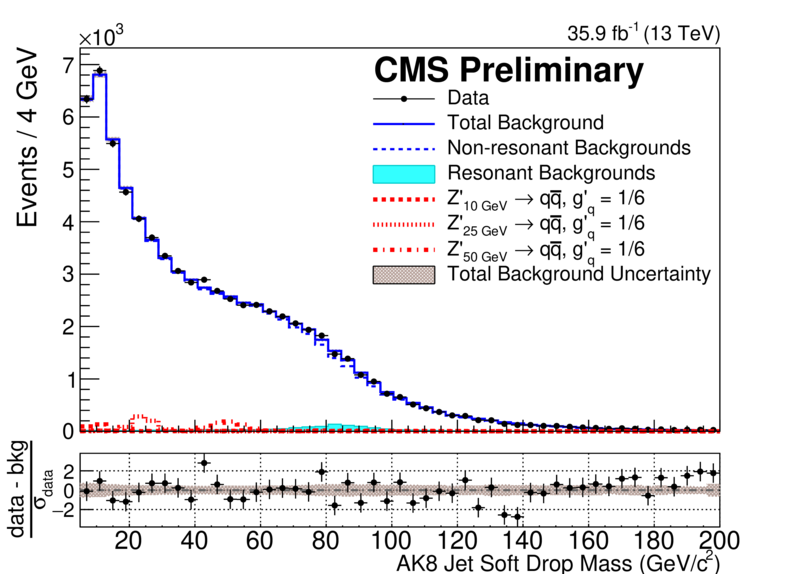 A new analysis at CMS exploits this fact by using a photon trigger, which has significantly lower thresholds than jet triggers, to search for Z’ particles otherwise inaccessible due to their low mass. Figure: The distribution of masses for large, two-pronged jets recoiling off of a triggering photon. New Z’ particles (simulation of a few hypothetical scenarios shown in red) would appear as a small bump on top of the background (in blue). No excess was observed in the mass spectrum. The new CMS analysis requires a photon with a transverse momentum over 200 GeV, much less than a hadronic trigger threshold, but still large compared to the mass of the Z’. Due to the fundamental principle of conservation of momentum, a Z’ produced in association with a photon would carry enough momentum that the resulting jets would largely overlap. Far from being a hinderance, this means that while such a decay would be initially interpreted as a single large jet, two “prongs” could be identified within it by making measurements of the jet’s substructure. This “two-pronged” property of the jet can be exploited to separate potential Z’ decays from the large background of jets produced from SM processes. Some background will still pass the substructure requirements, but it will be distributed broadly over a range of masses whereas a Z’ particle would appear as a narrow peak in the jet mass distribution. By evaluating the mass distributions of jets for such a peak, limits were set on the production of Z’s with masses as low as 10 GeV, the first result to directly probe Z’ masses below 50 GeV. Like many CMS analyses, this one was performed “blind”: the analyzers did not look at the data in the signal region until the method had been validated. While no evidence for a light Z’ was found, limits on their interaction with quarks provide important constraints to new physics models and the possible cosmic history of dark matter. Meanwhile, the CMS detector has collected more than three times as much data as was used in this analysis, opening the possibility to probe even smaller couplings of Z’.